Brig. Emmanuel Kanyesigye, the 4th Infantry Division commander in Gulu, said they will ensure all Balaalo cattle keepers are out of the region and warned strongly against resistance. File photo. GULU–The security committees from northern and western Uganda have set a deadline for Balaalo cattlekeepers to evacuate the region following the president directive in October this year. The meeting convened at the regional Office of the Prime Minister board room in Gulu town was attended by security committees from Gulu, Nwoya, Amuru, Oyam, Kitgum, Pader, Adjumani, Lamwo, Omoro and Agago districts. The participants resolved that Balaalo must exit the region not later than January 31, 2018. While addressing journalists, Santo Okot Lapolo, the Gulu Resident District Commissioner, said the date set is to give time for Balaalo to prepare for a smooth exit. “Balaalo must leave by January 31 and the various security committees are going to talk to them about the benefit of a smooth exit,” Lapolo said. He warned locals against taking the law into their hands. Brig. 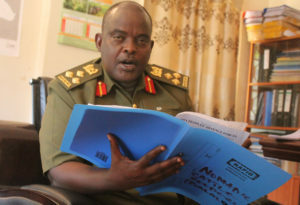 Emmanuel Kanyesigye, the 4th Infantry Division commander in Gulu, said the committee thought that the time given is enough for Balaalo to arrange for the exit, adding the they will ensure all Balaalo cattle keepers are out of the region and warned strongly against resistance. “Those (Balaalo) who do not want to leave will be fined or imprisoned or both,” he warned. He noted that the Security committee has also tasked the various District Veterinary Officers to examine the health status of Balaalo animals before they are transported back to their original place. The same committee also tasked district leadership to provide safe corridor where the animals will be passing. Lapolo noted that there is no room for Balaalo who have brought their animals to seek for legal document because the directive commanded every Balaalo cattle owner in the said districts to evacuate since they were reportedly causing conflict among communities on land. Over 58 groups of Balaalo have so far been registered in the 10 districts with some single groups having at least 100 people like in Amuru. Each of the groups in also noted too have over 1,000 heads of cattle, according to the report released by the security committee during the meeting. Gulu, Amuru, Pader and Adjumani districts are said to have the biggest population of Balaalo with the biggest number of animals. President Museveni this year in a letter dated October 24, directed the minister of Agriculture, Animal industries and Fisheries Vincent Ssempijja to ensure all Balaalo who were illegally rearing their animals in Western and northern Uganda leave the areas. In the same directive President Museveni instructed landlords to fence their land in case they want to give to Balaalo.